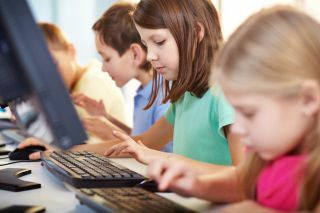 Typing.com now enables schools and districts using Typing.com in multiple classrooms the opportunity to set up a district-wide account, connecting schools and classrooms together and giving administrators access to progress reporting across schools. School and district accounts are free of charge. Administrator Role―New school and district administrator roles are available, in addition to the teacher role. Administrators can send instant invites to add new educators to the school account, assign roles, and view each of the other educators in the school or district. Add Multiple Teachers to a Class―This feature, created in response to users’ popular demand, allows for multiple teachers or administrators to manage individual classes. As a result, co-teachers, specialists and other educators can support the same group of students, and track and assess student progress. Custom Lesson Creation for Administrators―Typing.com recently released a new custom lesson creation tool for teachers. This supports cross-curricular learning by enabling teachers to generate original content for students to type, integrate with current events or classic literature, or focus on any other content students need to learn. This feature is now also available to administrators, who can create custom lessons and make them available to all teachers in the school.